Uncle Mike's Reflex Holster is designed for maximum ease of use in stressful situations where it counts most. The field-proven design has been function-tested in a variety of hostile environmental conditions, including mud, sand, extreme temperature ranges and water immersion. Made from injection-molded, impact-modified polymer, the Reflex is extremely durable. 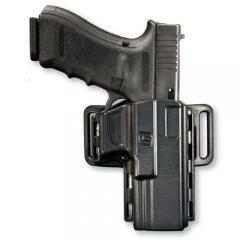 The holster features Uncle Mike's novel Integrated Retention Technology, a system that securely retains weapons without relying on mechanical parts that can stick or fail under pressure. The holster comes with a pancake-style belt loop that fits belts up to 1.75-inches wide. An optional paddle attachment allows for wear without a belt. Works well. Nice that it comes with paddle and belt loops. Very comfortable and versatile. No complaints thus far. If you fall on your side the right way (on the holster) the gun will come lose. will it fit a 1911, and does it have adjustment screws to adjust the compressionretention onof the weapon in the holster? Fits Commander 1911 and variants. No adjustment retention. with this holster work with a Kimber 1911 3 inch bbl, model ultra Aegis 11, 9MM, compact? The "Commander 1911 and variants" should fit your 1911. We issue the Sig Sauer P220R, which has the light rail. Will this fit the P220R? Yes, it will fit the Sig P220R.